Spread out onto a nonstick baking sheet. 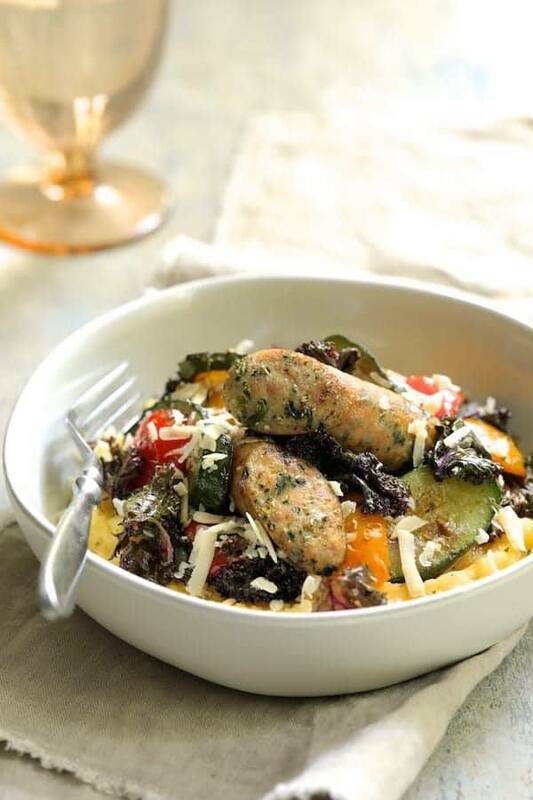 Place chicken sausage halves over vegetables. Roast for 10 minutes. Stir vegetables and sausage. Drizzle kale with remaining 1 tablespoon olive oil and season with salt and black pepper to taste. Place over vegetables and sausage. Roast another 15 minutes or until vegetables are tender and kale is slightly crispy and wilted. Drizzle with balsamic vinegar if desired. Serve over polenta. POLENTA: While vegetables are roasting, bring 3 cups chicken broth, butter, garlic and salt and black pepper to a boil in a saucepan. Stir in polenta then stir in cheese.